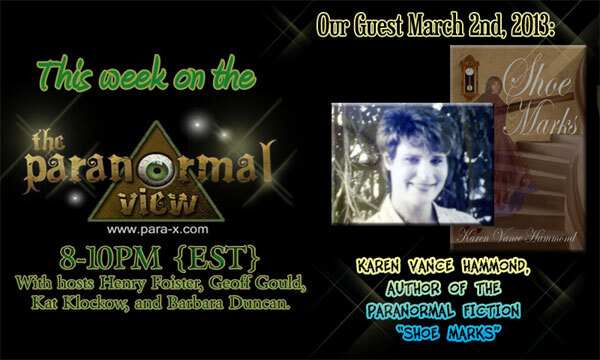 The Paranormal View welcomes author Karen Vance Hammond. We talk about her growing up and overcoming adversity’s to become an author and we talk about her best selling book ” Shoe Marks”. This entry was posted on March 3, 2013 at 8:13 am and is filed under Aliens/UFO, Ancient Mysteries, Cryptozoology, Ghosts & Hauntings, Psychic Phenomena. You can follow any responses to this entry through the RSS 2.0 feed. You can leave a response, or trackback from your own site. This web site is known as a stroll-via for the entire data you needed about this and didnâ€™t know who to ask. Glimpse here, and youâ€™ll definitely uncover it.